I chose the Tutti Fruiti suite from our spring Occasions catalog to make a Valentine’s card. 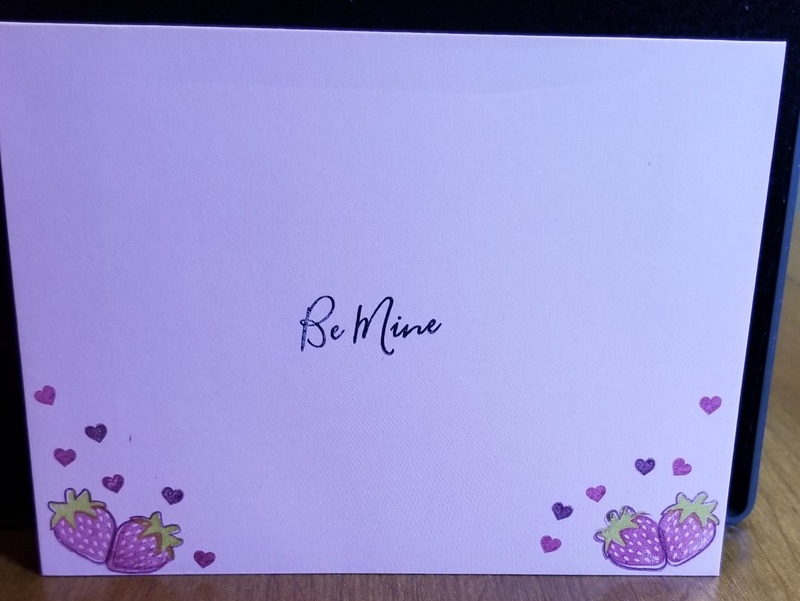 Some might think it an odd choice, but I love the sweetness of fruit, strawberries in particular, and it just called to me for this card. 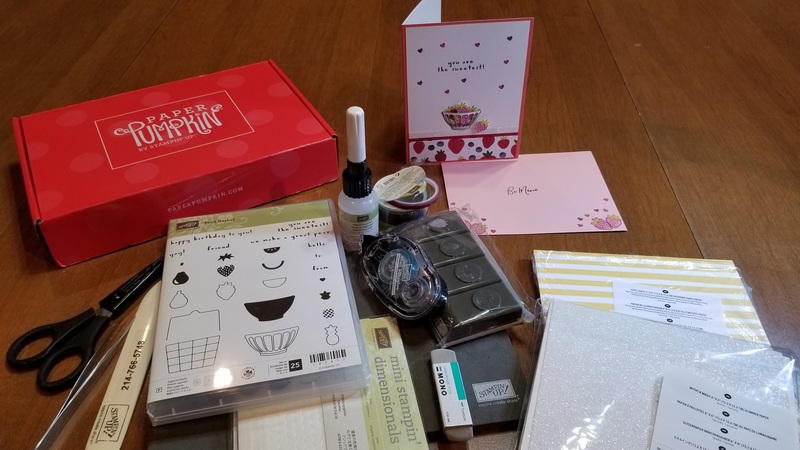 I also incorporated cards & envelopes from the Sale-A-Bration catalog and stamps from the January “Heartfelt Love Notes” Paper Pumpkin kit. I chose Tutti-Frutti cards & Envelopes from the Sale-A-Bration catalog for my base card. I love the color coordination with all of our products! I used 4″ square piece of Whisper White card stock to stamp 5 strawberries from the Fruit Basket stamp set. This is a 3-part stamp and I used Rich Razzleberry ink for the outline, Berry Burst ink for the strawberry, and Lemon Lime twist for the greenery. I used the strawberry punch for the berries. I used the same colors for the little hearts (5) from the same set and I stamped the peek-a-boo bowl in Basic Black. I fussy cut the tiny hearts. I used a Xacto blade to cut the peek-a-boo slots from the bowl before I fuzzy cut it from the main piece of Whisper White. I used 5 1/4″ x 4″ Whisper White for the front layer. To create a tabletop, the 1″x 4″ Tutti-Frutti DSP, then the thin Washi from the Tutti-Frutti pack, and a 1/4″ x 4″ strip of dazzling diamonds from the Myths & Magic Glimmer paper pack adhere with snail to the bottom of the WW layer. I stamped the peek-a-boo bowl and used the fine tip glue to adhere the fussy cut tiny hearts on the bottom and a couple of the strawberries in the bowl. Mini-dimensionals give two more of the strawberries some height in the bowl. Using the fine tip glue pen I adhered the peek-a-boo bowl I fussy cut over the berry & heart filled bowl. You have to give some pressure on both sides of the bowl for the glue to set. One strawberry (using a dimensional) sits on the tabletop. I stamped the sentiment one-third from the top of the WW layer and several tiny hearts scattered around. 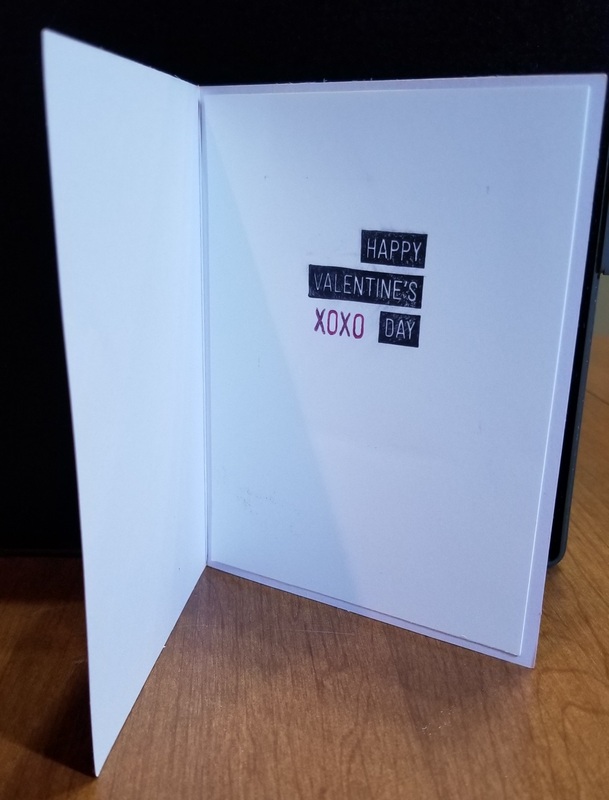 I adhered this layer with snail to the card front. Inside I used a sentiment from the Paper Pumpkin kit and I stamped Be Mine sentiment from the same kit on the Envelope and a couple strawberries & hearts in each lower corner.